A Kickstarter You Say?Featuring Lovecraft and Cthulhu?Take My Money! So it's been a while since I've done a blog post so I'm sorry about that. I plan to get back to regulary updating you with what we are doing here at Devil and Co, and also collecting and commenting on the interesting things I find online. I will mostly be focussing on the kind of toys, comics, games, crowdfunding campaigns I think you will be interested In. Over the coming weeks and months Devil and Co will have more and more new art prints, greeting cards and more in the store so I hope you will visit regulary to see what we have on offer. We all know that Cthulhu is and always has been a pretty big deal but when it comes to his place in the mainstream he's never been bigger. Toys, books, comic books, clothing, it's all available. This is a wonderful idea, it's a mix of 'Monster In My Pocket' and 'Cabbage Pail Kids'. The perfectly formed minifigures that stand 40mm tall, have Cthulhu as different characters such as Elvis, Marilyn Monroe and a skater. There are currently six minifigures in total accross the first 2 series of figures but there is a stretch goal in which they will release the 3rd series of figures if they hit that figure. I must admit the artwork in these is wonderful and I said previosuly, reminds me of the famous 80s stickers The Cabbage Pail Kids, although a much less disgusting version! There's 80 stickers in total to get and they come in packs of 5 and if you fancy yourself an entire box, you get 36 packs. They also offer some great extras such as t-shirts and a colouring book. An animated movie based upon "The Call Of Cthulhu" and "The Shadow Over Innsmouth" is brought to you by Walter Rastelli, a young Italian director. Rastelli first caught the Lovecraft bug when reading an old battered copy of "The Call of Cthulhu when he was fifteen years old. This has manifested itself in this ambitious and extremely interesting take on the previously mentioned stories. The story sees a young student finding some documents and a clay statuette of a monster, left to him by his great-uncle. He's goes through the notes and starts to piece together stories from different times and places. There are plenty of cool items for potential backers to grab hold of. From T-shirts featuring amazing artwork to the Blu-ray of the finsished movie itself. There's even a soundtrack. I really hope that this talented team reach their target and make this movie a reality, as I can tell that this is a real passion project. This very interesting take on Cthulhu seems like something you wouldn't necessarily need to be a Lovecraft fan to enjoy, although it probably helps. Bringing the Cthulhu mythos into the twenty-first century and mixing it with the worst parts of big business is a really clever idea and makes a great point that the giant corporations that rule this world are to be feared at least as much and in some cases more than the monsters that sit and wait at the bottom of the sea. Ninteen stories lie wait for you in this book although if the stretch goals are reached there will be even more added to this list. Rewards range from the digital copy of the book, paperbacks, various other books by the raft of different authors and signed books. This is a great modern take on Cthulhu and I emplore you to check it out. Come on! I couldn't very well leave my own project out of this small and perfectly chosen list of amazing Cthulhu Kickstarters, could i? 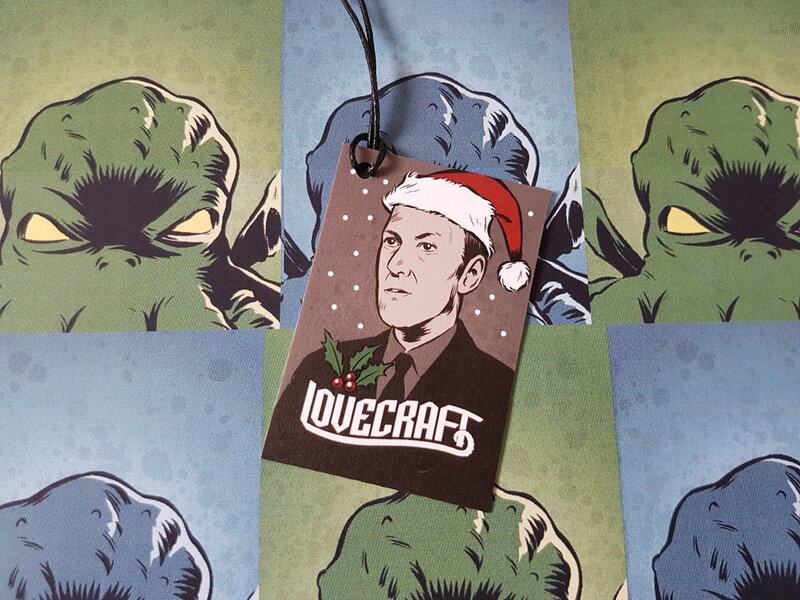 Featuring a classic Cthulhu and H.P Lovecraft gift wrap and then a Christmas version of both along with accompanying gift tags, these will improve any present. A stone, some twigs, empty boxes of various sizes, you can wrap one of these up and they will probably never see the light of day as who in their right mind would want to tear this lovely wrapping paper. So there ends our little list of Cthulhu Kickstarters that are currently alive and well on Kickstarter(as of 8th October 2017, If you reading this 10yrs in the future who knows what's on Kickstarter!). I hope you enjoyed reading it and I hope it inspires you to head over to Kickstarter and take a more indepth look or to even start the journey of your owen Lovecraftian project. 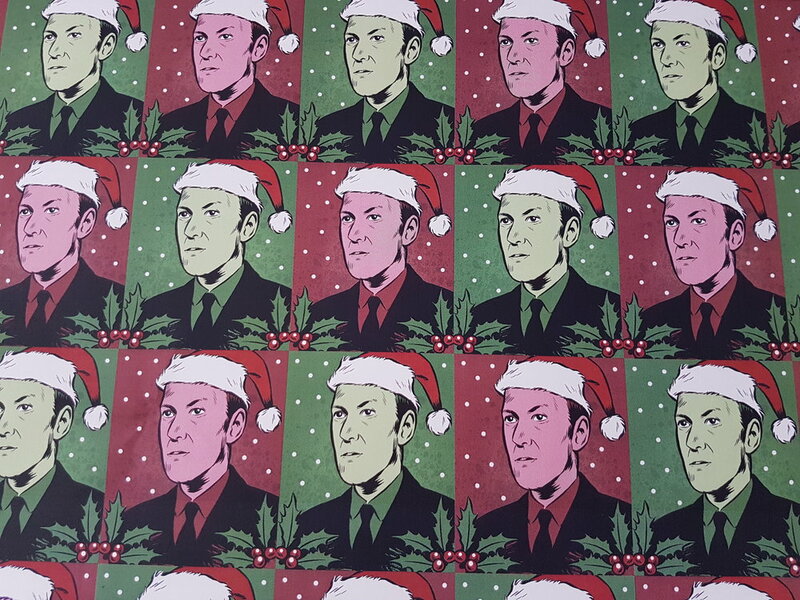 So it's official the Kickstarter project for the Lovecraft and Cthulhu gift wrapping paper(Seems in the UK we call it wrapping paper and in the US and a few other places it's gift wrap so I split the difference)has been launched, it's live, it's alive, it's currently happening etc. Well I hope you like them as much as I do. Head over to the Kickstarter page to read more and if you are interested in backing this fine campaign. Many Thanks. For those of you that love nothing more than to stroll the virtual aisles of Etsy, then good news! Devil and Co have taken over a small, dark, sinister and probably damp corner of the Etsy world. Click on the below image below to be sent through a web-based worm hole and over to us at Etsy. It's that superhero from Hell's very own kitchen once again. This is the 'Shadowland' version and his crew of ninjas. Sun Devil by Patricia Smith. Love the shae of red in this one. A list of some comic books currently on Kickstarter. I think they all look pretty darn good myself. What do you think, reader? Whilst browsing Firebox I came across a really cool book that contains a polygon-style mask of either a fox or a skull. Now this is just the kind of thing I like so I did a little googling (other search engines are available of course) and found Wintercroft.com. Steve Wintercroft and his wife Marianne have been designing and supplying all sort of magnificent masks ever since Steve made a Halloween mask which was well received by his friends. There's a plethora of amazing masks to choose from including Halloween and half masks. The masks are sent as downloads so you can print them off at your own leisure. There's advice including a video to show you how to do this. This Devil features in a set of wonderful tarot cards. Designed by Linnea Gits and Peter Dunham , the 'Pagan Otherworld Tarot' is available over at uusi.us along with a plethora of other amazing treats. I love this and the design of this devil suits the tarot style so well. This a wonderfully dark and mysterious devil. I love light bursting out behind him. The talented artist behind this goes by the name of Tobias Jonassen. If you want to see some more of his wares then head to his Artstation.com page.